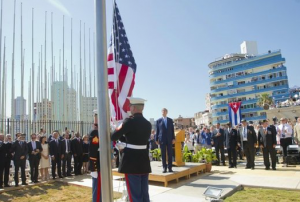 Today the American flag was raised over the American embassy in Cuba after 54 years, signalling a new relationship. As reported in BBC America, Cuba reopened its embassy in Washington last month but the former Cuban leader Fidel Castro has blasted the US for not lifting its trade embargo. In an open letter on Thursday, Mr Castro said the US owed Cuba millions of dollars because of its 53-year-long embargo. The letter makes no mention of the reopening of the US embassy. Does that remind you of another foreign policy action in the past month where the leader of the country we were ‘making a deal” with said this: “Our policy regarding the arrogant U.S. government will not change,” Mr. Khamenei said in a televised address to mark Eid al-Fitr, the Muslim feast day at the end of the holy month of Ramadan. “We don’t have any negotiations or deal with the U.S. on different issues in the world or the region.” “Whether [the deal is] ratified or not, we will not give up on our friends in the region,” Mr. Khamenei said. Sounds like two good relationships doesn’t it? Yes, the opening of relationships with Cuba and the nuclear deal with Iran evoked similar responses from its totalitarian leadership, America must pay, in dollars in Cuba and it opposition in Iran. Hard to imagine this is an action to be celebrated. Nothing has been gained for either side, though some believe that we are going back to Cuba without some kind of gain is a victory for Castro. That remains to be seen. But given the weaknesses of the Obama Administration, it is a reasonable fear. But one thing is clear around th world, the message is consistent about America’s lack of leadership in the world.